White barbecue sauce. If you’re like me, you’ve probably never had it before. You may never have even heard of it unless of course you are from Northern Alabama. Decatur to be exact and the surrounding area of about 75 miles. This sauce is said to have been created by Big Bob Gibson back in 1925. Bob was a railroad worker, but had a passion for barbecue. He set up a table nailed to a sycamore tree in his backyard and friends, neighbors and fellow railroad workers began lining up. Soon, he was making more as a pit master and gave up his job for the railroad to concentrate his time and efforts on Big Bob Gibson Barbecue. Legend has it that Bob developed his signature white barbecue sauce for a customer who hated tomatoes and they’ve been making it ever since. The chief components are mayonnaise, vinegar and black pepper. Just like with all barbecue sauces, what else is thrown in will vary by who you ask. 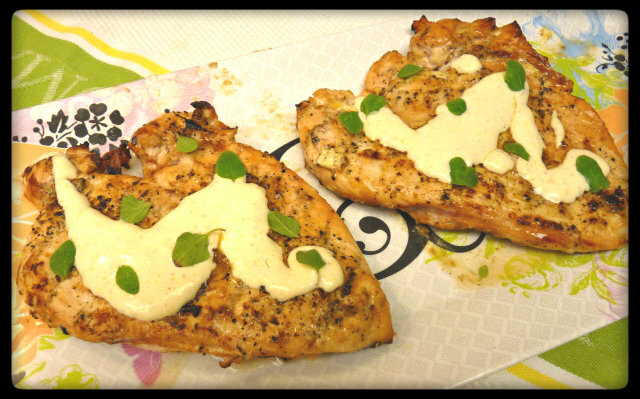 Traditionally, white barbecue sauce is served over chicken halves that have been slow smoked for hours over hickory. Wait….that’s not quite right. 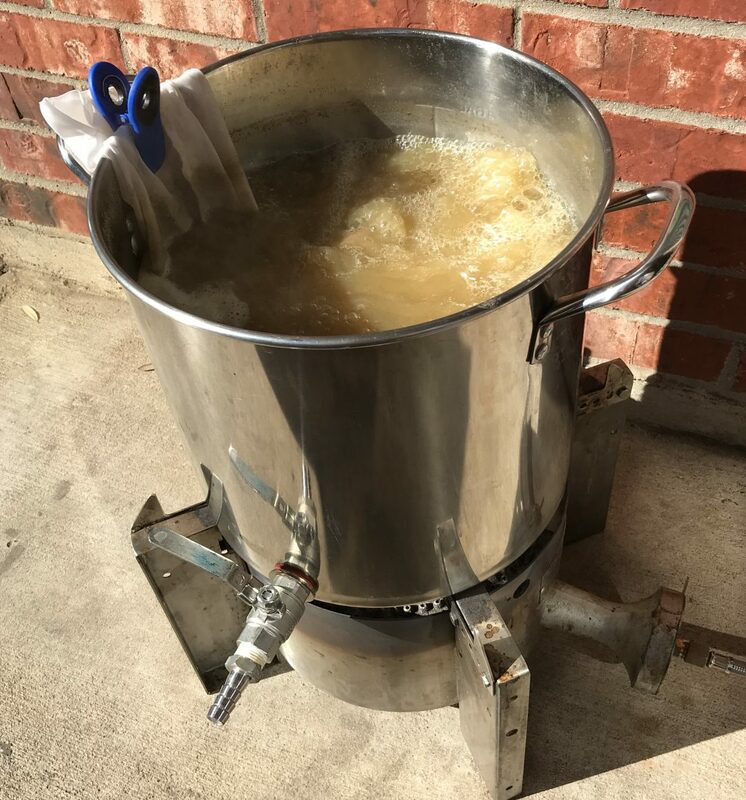 The chicken is actually dunked in a tub of white barbecue sauce after it is finished. Then, it is served with more sauce on the side. Last night being a weeknight, I didn’t have the time to slow smoke chicken halves, so I didn’t prepare this the traditional way. But I was curious about the sauce and wanted to try it. 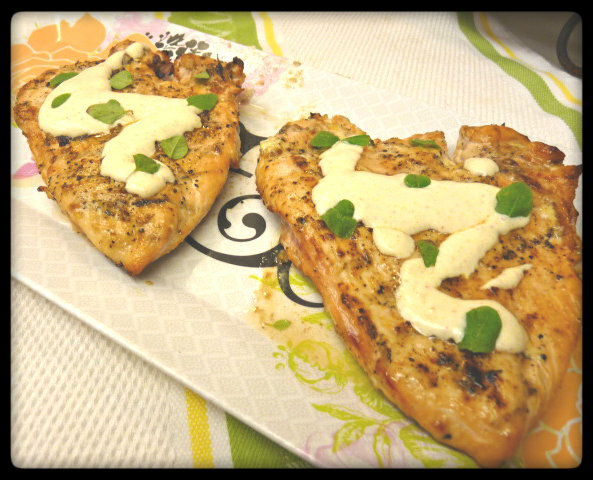 That and I had some chicken breasts I had to do something with to spice them up. 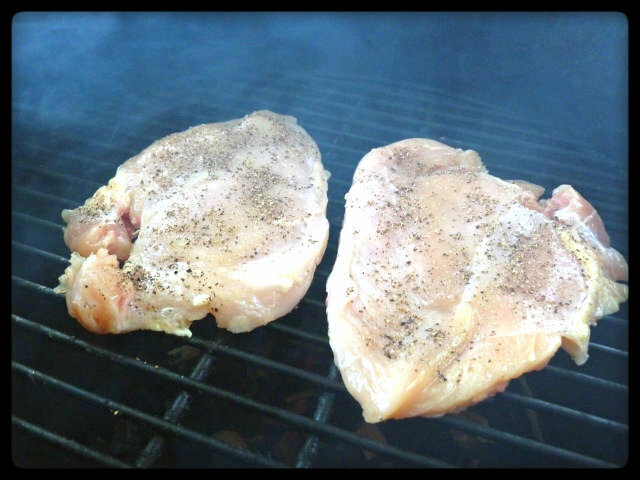 So I basted them with the sauce as I grilled them up just to get an idea of what it would taste like. 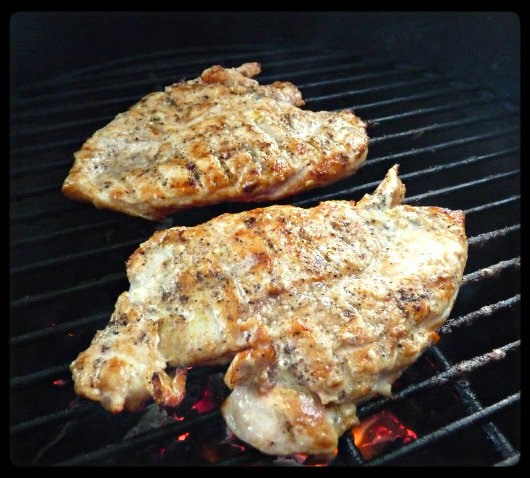 Set up your grill for direct grilling at medium-high or 400F. 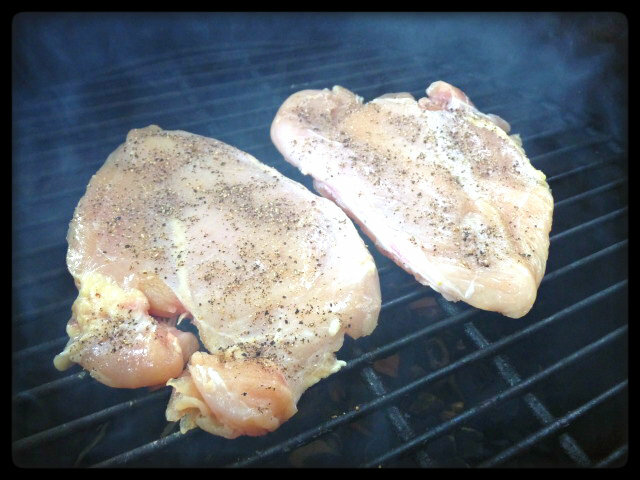 If using wood chips, toss in a handful right before throwing on the chicken. Serve chicken with reserved barbecue sauce on the side. I’ll admit it. I was a bit skeptical about white barbecue sauce. How can it be barbecue sauce if it doesn’t contain tomatoes in some form or another? Whether it be diced, crushed, sauce, paste or even ketchup. Mayo based? It just sounded weird to me, but also intrigued me. I had to try it. You may as well get any ideas of normal barbecue out of your head before trying white barbecue sauce. Normally barbecue sauce is a little sweet, a little sour and maybe has a bit of heat. This does not. It does not have that sweet element at all (although I did see some recipes that called for Miracle Whip or sugar which would add that sweetness to it). What it did have was a cool, creamy, vinegary flavor with a bit of heat. A very unusual flavor to be sure, but also very good. Definitely a twist on what most people consider barbecue. Something I will do again for sure, but next time I’ll go with the slow smoked chicken halves. Maybe even use it to make some pulled chicken sandwiches with coleslaw. 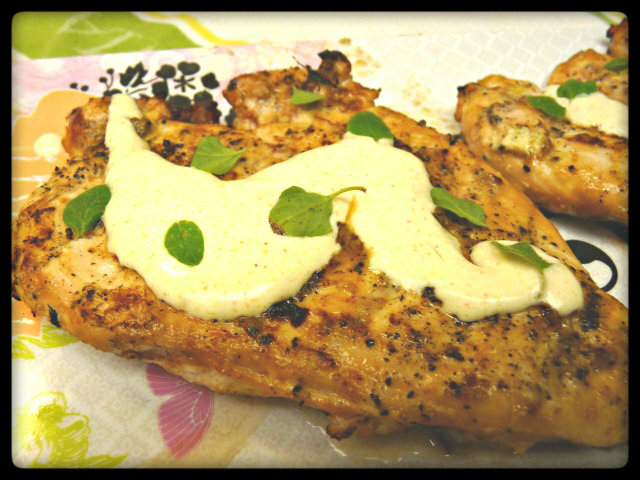 If you like love barbecue in all its many forms or are just looking for something different to try, I recommend looking into white barbecue sauce. Definitely worth a try. I got a new smoking/grilling book today and it has a white sauce recipe in it. Funny, because that’s what I settled on to make first! That does look really delicious. I make a dipping sauce with light mayo, vinegar, mustard, a bit of low fat sour cream and various spices and herbs. It goes great with veggies and chicken in particular. Being a northerner, I’ve never thought to call it a BBQ sauce but it is good. Got to try this one. Love the variety your site offers. I’ve heard so much about white BBQ sauce and have been tempted to try it..although many scoffed..asking ‘Mayo??:. Well..it’s just oil and eggs, right lol? Your chicken looks delectable with it! Grilled this tonight! It was so different than any other BBQ, but definitely a new favorite in my house. Thanks for sharing. This is one of my favorite BBQ sauces for chicken ever and I like doing it as a basting sauce like this. We call it dip and flip because we dredge it right in the sauce while cooking. How’s Germany going?